Thank you for your interest in our business memberships! Our business membership options have been developed to provide NEWH business members with flexibility to accommodate more of their practice groups, at a value driven pricing structure. Click here for a visual comparison of our business memberships! These are the perfect memberships for those businesses that have more than one employee at the same geographic location who are interested in joining the local chapter. These memberships belong to the business so if an employee leaves the company, the business can identify a new employee to take on the vacated membership. Additionally, employees of the Business member will be able to attend the primary chapter’s programming events, excluding fundraising events, at member pricing. A courtesy listing in the Business Directory and a premium listing in the NEWH Online Resource Directory, including the company’s logo, four installation images, and a link to the company website will be included with this membership. 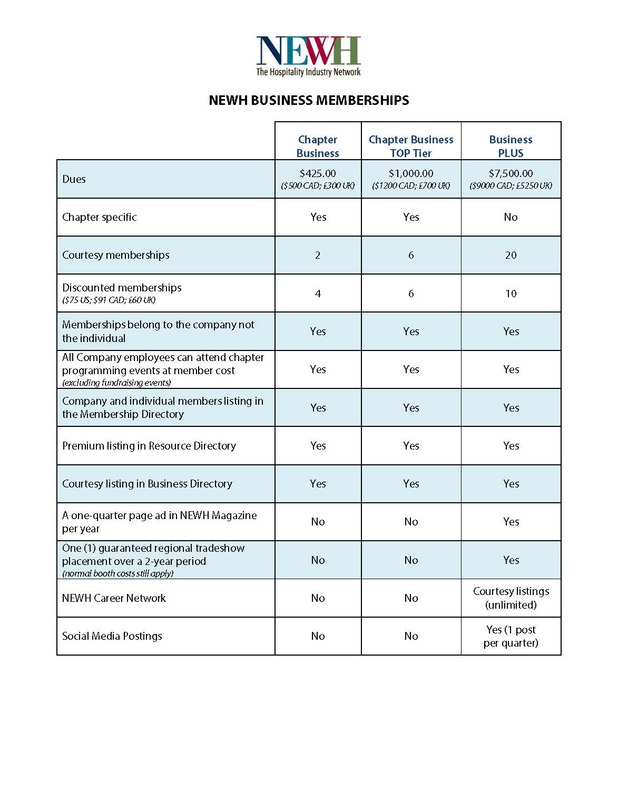 The Chapter Level Business – Top Tier membership is priced at $1,000 ($1,200 CAD, £700 UK) and enjoys the same benefits as the Chapter Level Business (below) but includes 6 courtesy and up to 6 half-price memberships.